It has happened a lot since I wrote last time. Some pleasant and some less pleasant. Me and the dogs have been to Norway to the Belgianclub breed special. Alpha was BOB both days and BIS 3. Axxa were offeciell for the first time in the junior class. She received CAC both days! I am so happy about this. Both did very well and I had such a nice time. Met a lot of old friends and made some new ones. I am now up and running and working full time again after a long period of sick leave. In late September, I where with Alpha on a four-day military exercise with the Homeguard. We had so much fun. It was really well organized and the dogs and handlers were really put to the test. The first puppies from Alpha and Quint litter has been x-rayed. Axxa is free in hips and elbows, Harry to. Garm has ED 1/1 but free HD. We’ll see what the conclusion will be when all are x-rayed. This will be done in during fall and winter. Last weekend we had a puppy meeting of the litter and at the same time, I had notified them to do the mental description(MH in Sweden). We gathered on Friday and the last joined Saturday. Some other friends were invited that have Laekenois so over all it was 14 Laekens with owners. So many laekenois in the same place at the same time is unusual. 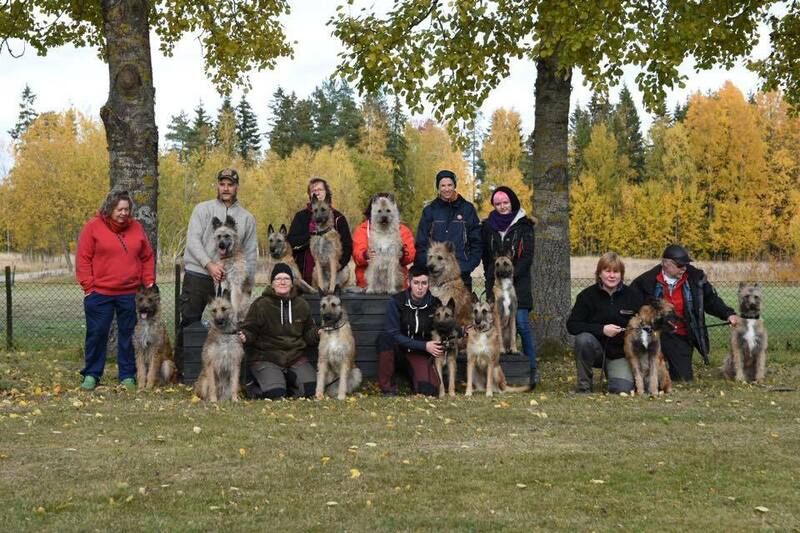 We had a really nice weekend together with lots of talk and training with the dogs. On Sunday Axxa, Skoll, Ymer and Thurbo their mental description. All 4 behaved very well and is totally shotproof. All have much fighting spirit and great interest of objects . They abreact in a very nice manner to any discomfort that they were subjected to. Garm had damaged a tooth so he has to wait until it is healed before he does his test and Harry wait a bit as well, and will do it later in the fall. Thank you all my friend for a lovely weekend with much laughter!